Peugeot will sell three- and five-door versions of the 208. 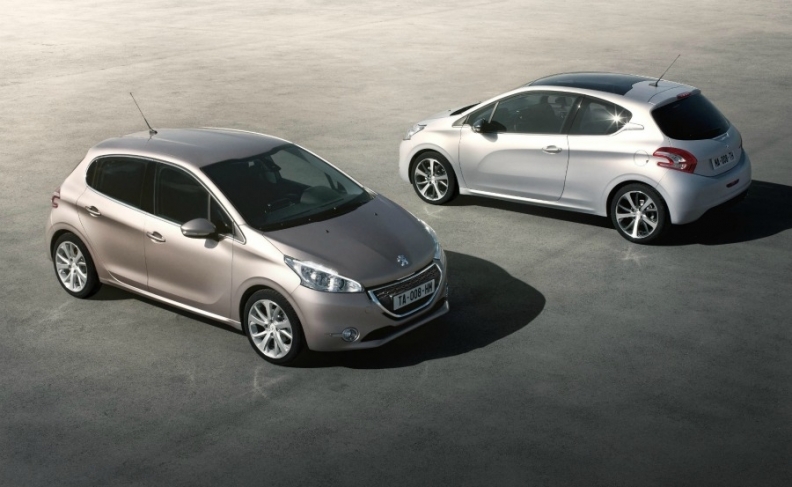 Peugeot's new 208 subcompact will be smaller and more fuel efficient than the 207 car it replaces. The rival to the Ford Fiesta, VW Polo and Renault Clio will be launched in Europe next spring with a new range of downsized three-cylinder gasoline engines with 1.0- and 1.2-liter displacements. The most fuel efficient gasoline engine will have CO2 emissions of 99 grams per kilometer. The model's range of diesel engines will offer CO2 emissions as low as 87g/km. Peugeot said the 208's average CO2 emissions are 34g/km lower than the 207. The car is 70mm shorter and 10mm lower than the 207, but the wheelbase is the same. It is also 110kg lighter on average compared to the 207, with the base version weighing 975kg. Inside rear passengers have 50mm extra legroom and the trunk space is 15 liters larger at 285 liters. Peugeot said the 208's design highlights the brand's new styling which is intended to give the brand a modern "sculpted, athletic, pure and sophisticated" look. Peugeot sold 189,069 units of the 207 in the first 9 months, down 19 percent on the year before, according to JATO Dynamics.